Each month I participate in a "Happy Art" swap and trade art cards with ladies from around the world. Organised and traded by my friend Sandie..(see button on my sidebar) I have found that I make beautiful colourful backgrounds for my cards and each month I struggle to complete them as I don't want to cover them up. I've been brainstorming hard this month about how i can overcome this and I have arrived at a new technique? One of the ideas that has been floating around is what happens to paper when oil gets dropped on it, it becomes translucent. This is the effect I wanted to achieve. 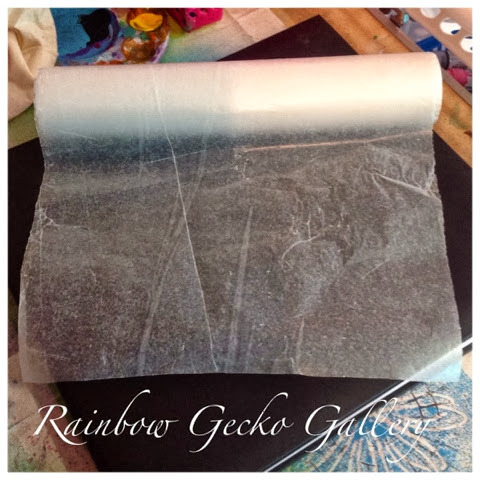 I had a roll of "lunch wrap" that I bought from the supermarket in my studio and it was a little transparent. I never used it before as it made white fold lines when scrunched, but it was perfect for this project. Lunch wrap waxed on one side paper on the other. 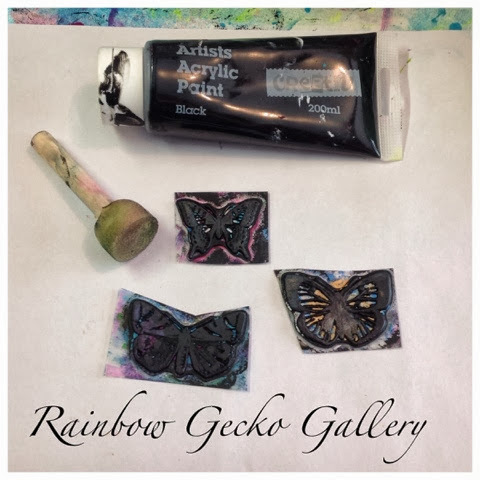 I have rubber stamps that I use in my art (I confess I don't have any stamp pads) I use my rubber stamps with acrylic paint, I'm not sure how this would work with ink as the paper is waxed but it may work if you stamped on the paper side, I suggest using waterproof ink. I gathered up my usual supplies, pouncer, well loved stamps, and black acrylic paint. Using the pouncer foam brush apply paint to stamp and press onto paper. Yes it's that simple. 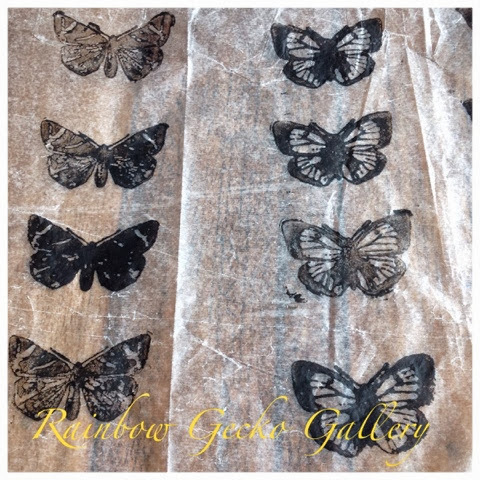 Here is the finished pieces stamped onto lunch wrap paper. When dry cut out around your butterflies, I left a gap but you can cut around the outline. I got a spare background card and painted the non stamped side with clear school glue. Once I glued the butterfly the paper became more translucent. I carefully placed the butterfly onto the card and added more glue if needed. This was the step I was concerned about. I had to seal the top side of the butterfly, the stamped side and I didn't know by doing this if the paint would come off the paper. 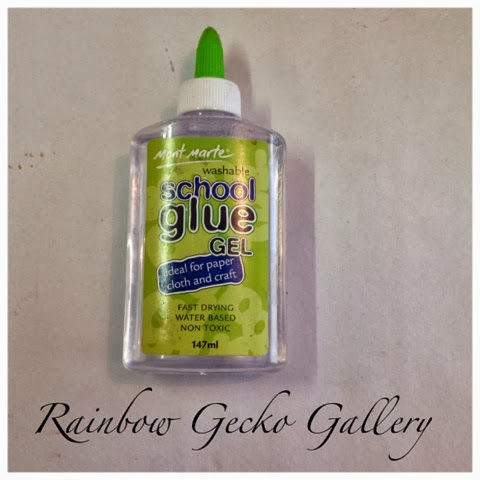 I used the same glue and coated the top and the paint didn't come off and you could see the coloured background through the wings of the butterfy. It worked. 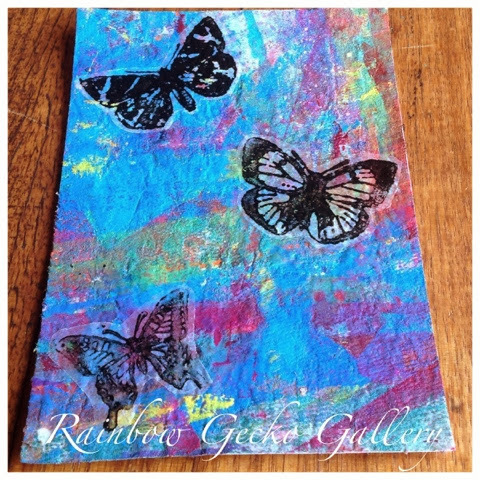 Here is the butterflies on the background of the card for the happy Art swap. It is not clear like a sticker would be but it's a great way to layer over colourful backgrounds.